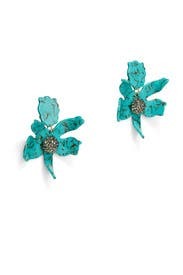 Turquoise acetate petal earrings with a Czech pave crystal center. Clip backs with comfort pads. 3" long and 2.5" wide. 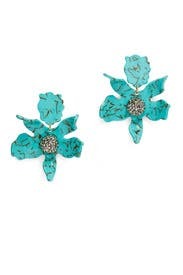 Light weight earrings that look great! 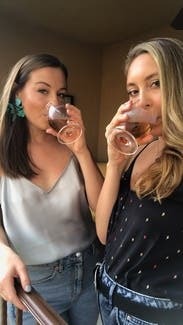 Wore these earrings with the Cooper & Ella black cold-shoulder blouse and loved it! They are clips on and you may need to give your ears a break every once in a while and take the earrings off. Got lots of compliments! Amazing earrings for vacation - I wore these almost every day of vacation. They go with tees or to dress up a look. Note these are clip ons - so I usually last about 4 hours, but they tend to hurt for long periods.